The third edition of the defining text for the graduate-level course in Electricity and Magnetism has finally arrived! It has been 37 years since the first edition and 24 since the second. The new edition addresses the changes in emphasis and applications that have occurred in the field, without any significant increase in length. 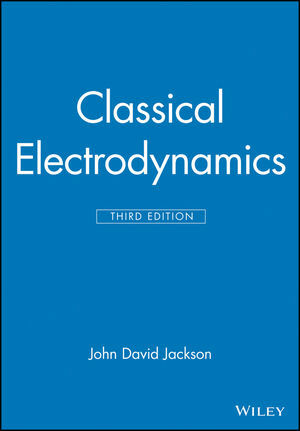 John David Jackson is the author of Classical Electrodynamics, 3rd Edition, published by Wiley. Boundary-Value Problems in Electrostatics: I.
Boundary-Value Problems in Electrostatics: II. Multipoles, Electrostatics of Macroscopic Media, Dielectrics. Magnetostatics, Faraday's Law, Quasi-Static Fields. Maxwell Equations, Macroscopic Electromagnetism, Conservation Laws. Plane Electromagnetic Waves and Wave Propagation. Waveguides, Resonant Cavities, and Optical Fibers. Radiating Systems, Multipole Fields and Radiation. Dynamics of Relativistic Particles and Electromagnetic Fields. Collisions, Energy Loss, and Scattering of Charged Particles, Cherenkov and Transition Radiation. Bremsstrahlung, Method of Virtual Quanta, Radiative Beta Processes. Radiation Damping, Classical Models of Charged Particles. SI units used in the first 10 chapters. Gaussian units are retained in the later chapters. New sections on the principles of numerical techniques for electrostatics and magnetostatics, as well as some elementary problems. Faraday's Law and quasi-static fields are now in Chapter 5 with magnetostatics, permitting a more logical discussion of energy and inductances. Discussion of radiation by charge-current sources, in both elementary and exact multipole forms, has been consolidated in Chapter 9. Applications to scattering and diffraction are now in Chapter 10. Two new sections in Chapter 8 discuss the principles of optical fibers and dielectric waveguides. The treatment of energy loss (Chapter 13) has been shortened and strengthened. The discussion of synchrotron radiation as a research tool in Chapter 14 has been augmented by a detailed section on the physics of wigglers and undulators for synchrotron light sources. New material in Chapter 16 on radiation reaction and models of classical charged particles.